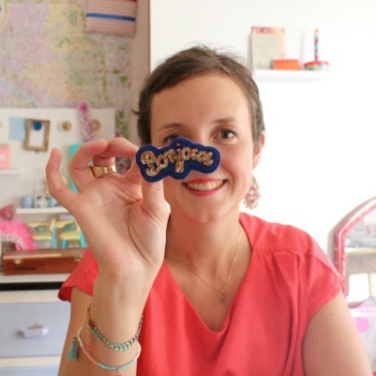 Marie Maglaque Blog: NEWS :: A Solo Exhibition in Tokyo in May! There are so many things happening at once at the moment that I am getting (slightly) overwhelmed! It's finally time to announce you the greatest news - something I have been working on since Christmas: I will have my first ever solo exhibition in Japan this coming May! To say that I am excited doesn't really reflect the reality; I am alternatively excited, scared, delighted, nervous, enthusiastic, feverish, joyful, ecstatic, focused, thrilled... the list goes on. I am definitely under pressure though! 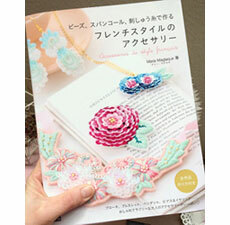 I am presenting a series of embroidered accessories - from earrings to necklaces, bracelets, brooches and bags, and the theme is of course around flowers. 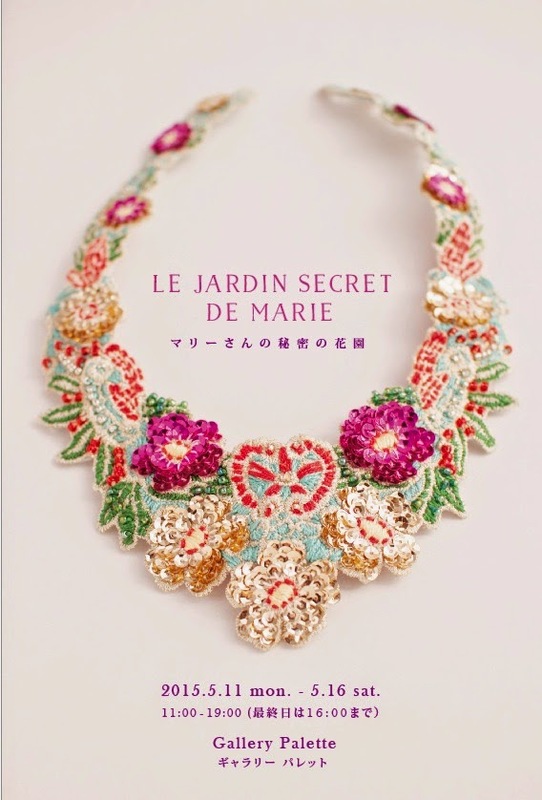 We named the exhibition "Le Jardin Secret de Marie" [The Secret Garden of Marie] with a reference to the best-seller "The Secret Garden" by Frances Hodgson Burnet. Every single piece is hand-embroidered by yours truly so you may call it a labor of love - and passion. To stay true to myself, it will all be colourful and shiny with exquisite details and delightful color combinations. The exhibition will take place at the newly launched Gallery Palette in Minami-Aoyama (a short walk from Omotesando station) in May 2015. I will be present every day at the gallery and also give a series of workshops on May 13 (Wed), 14 (Thu) and 15 (Fri) in the afternoon -> more coming later on, once all the details are finalised and made available on the website of Gallery Palette. Please drop by to say hi and have a little chat! You can check and like the Facebook page of Gallery Palette to keep in touch with the exhibition schedule (there are two exhibitions happening before mine) and sign up for the workshops. I am so looking forward to meeting you there! Congrats on the solo exhibition in Japan Marie, i'm so happy for you and really wish i am there to participate! 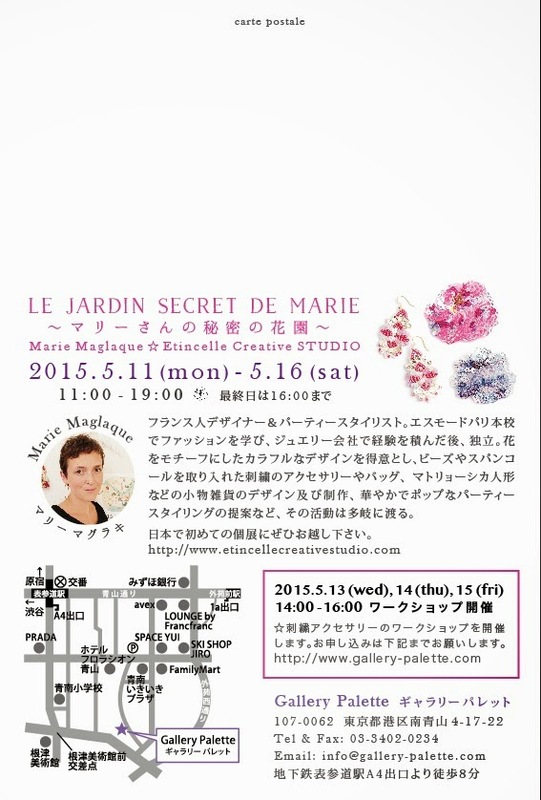 The name of the exhibition'Le Jardin Secret de Marie' are truly beautiful and suits you so much. Oh yes, i am writing a blog now, started not long ago, sharing something i love to do, something im interested in, snail mail, gardening, foods & recipes and many more! drop by when you free! have a lovely day!